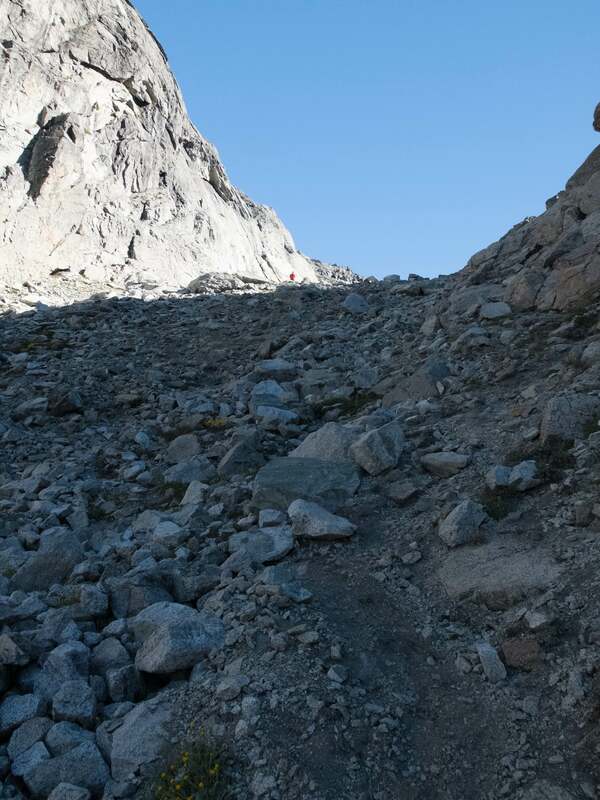 The poorly marked trail from Laguna Jakob to Laguna Negra has some semi-technical climbing involved. Doing it alone was never a consideration. decide it was too risky to do and turn back to the refugio. From there I would do the easy but long 18 km walk down along the Arroyo Casa de Piedra to the highway and then hitchhike over to Colonia Suiza where I would spend the night at a campground. 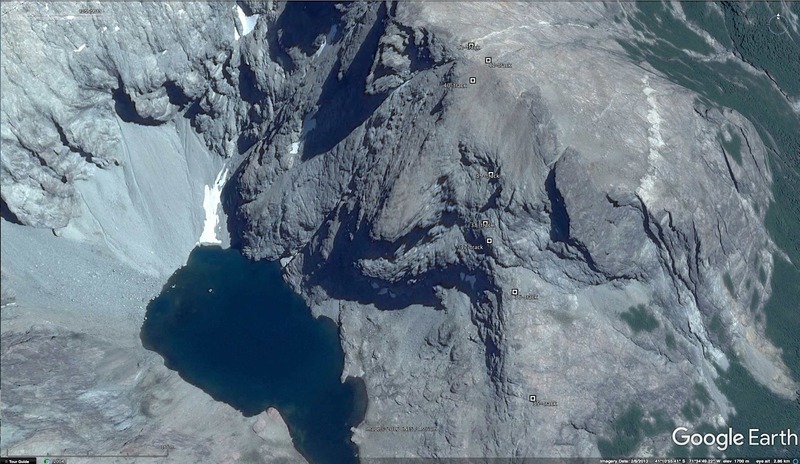 The next day I would walk up to Laguna Negra from there and continue the traverse. Option #1 is made up of Routes 9 and 7 to Laguna Negra. Option #2 is Route 3 following the Casa de Piedra down to Highway 79. 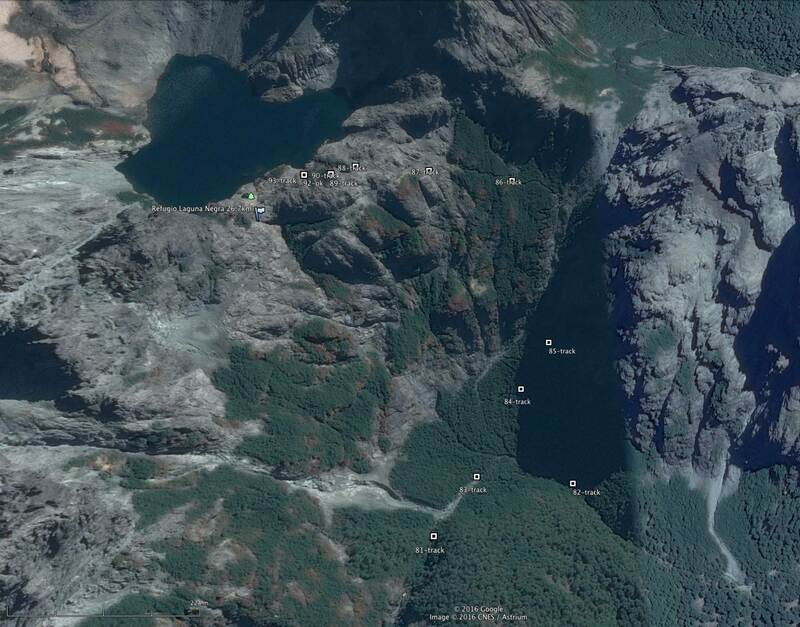 I must again acknowledge the website I took the above map from, TrekBariloche. 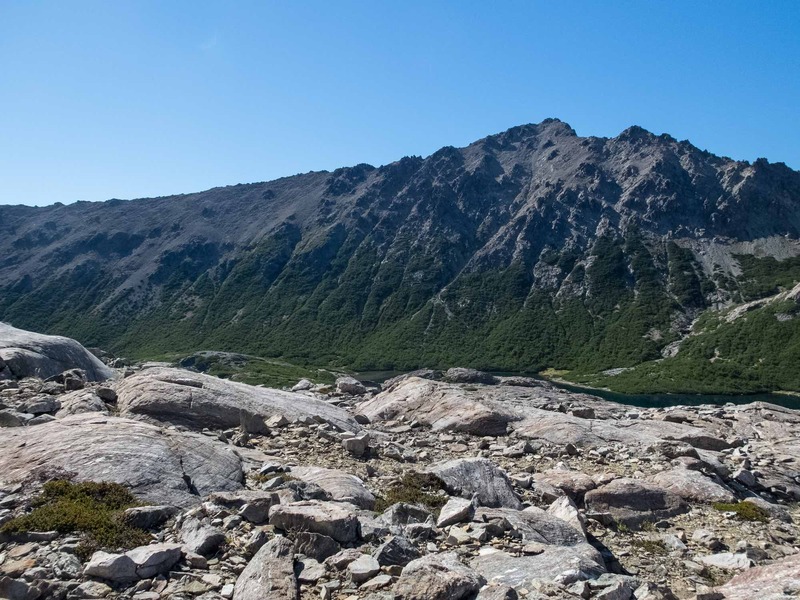 It is the single best online source of information of hiking in the Nahuel Huapi area. 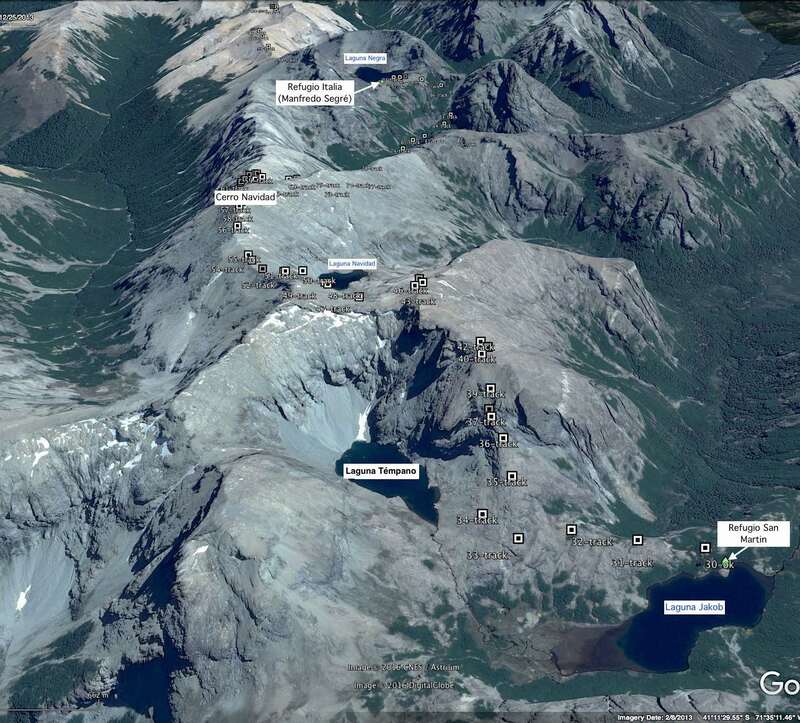 The writer has walked these trails for the past 18 years and it shows in detail found at his website. 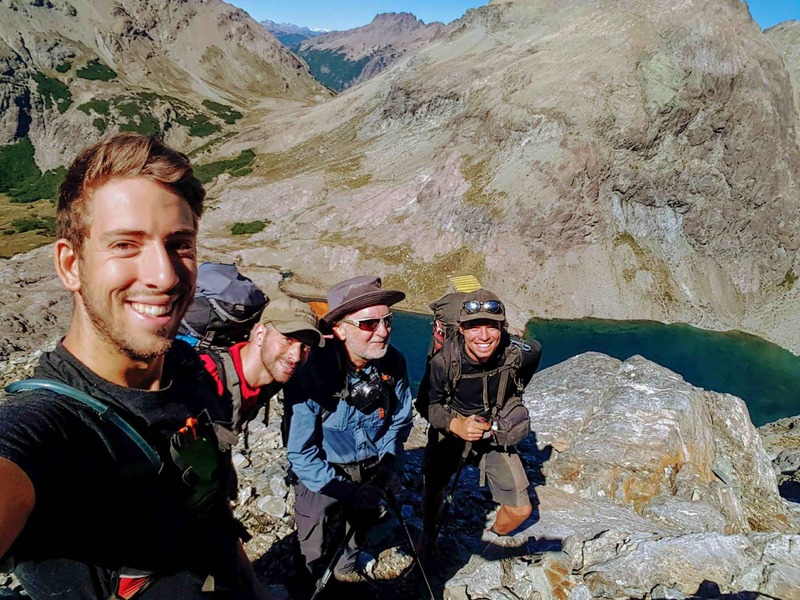 There were four of us – Moritz and Daniel, the two German guys; Diego, the hiker from Buenos Aires; and me. We eventually found ourselves signing the waiver form to acknowledge our intent to do the route to Laguna Negra via the Laguna Témpano ascent. The hut keeper also brought out a scrapbook with perhaps 40 or 50 photos that he talked his way through. They illustrated major points in the route. I will admit that after twenty images or so my mind drifted away – information overload! There is no way you can remember all that stuff. Detail piled on detail! Had I been thinking I would have taken some photos of his photos with my iPhone so that I could consult them during the day. 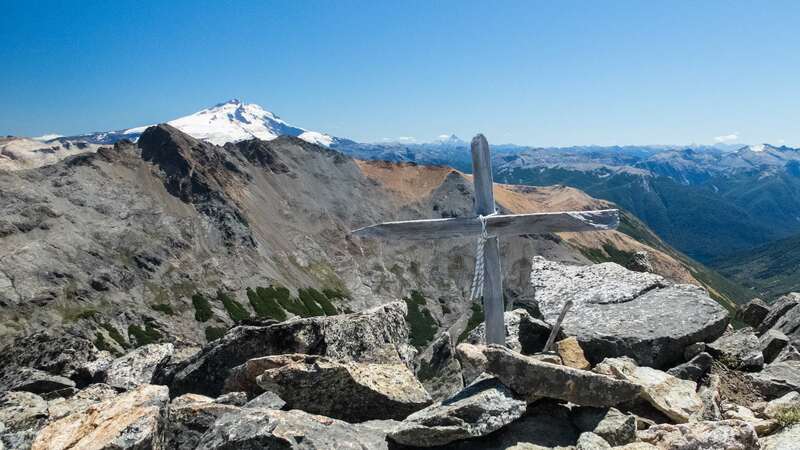 Another thought that came to mind was this – why don’t they just provide hikers with better information – a brochure, for example – that they could take with them. 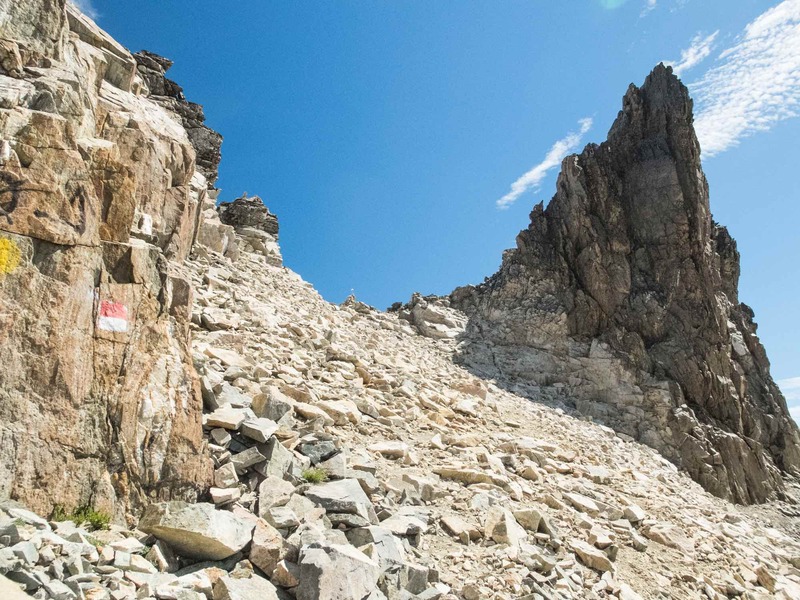 That, and a more clearly marked trail, which would not take more than a day’s work for park workers to do, would eliminate most of the issues with this section of the traverse. 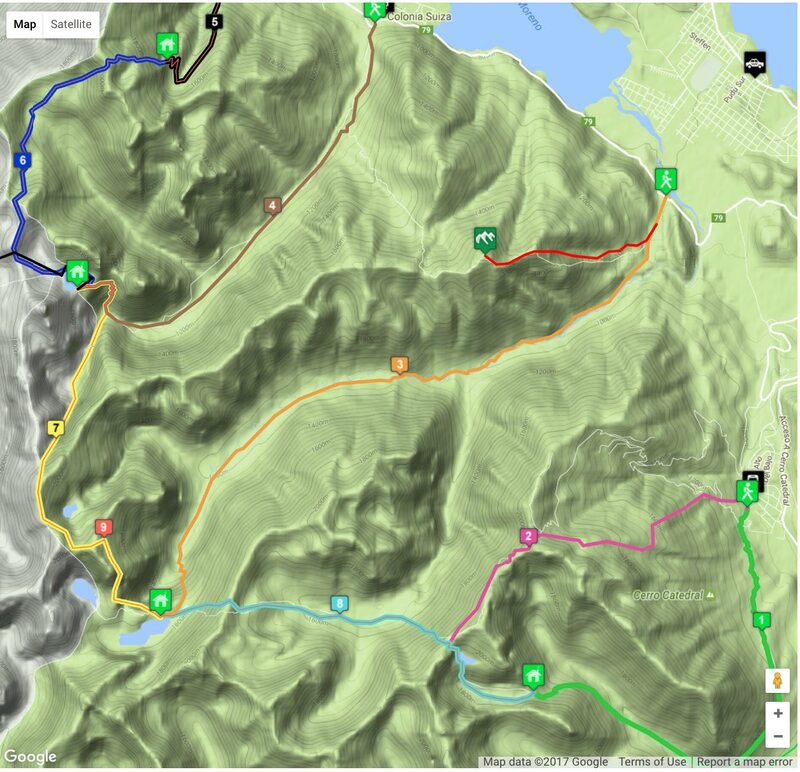 I have never wallked a trail as poorly marked as the one I did on this day! Of course, a clearly marked trail would only encourage more people to do this section and thus increase the possibility of bad things happening! 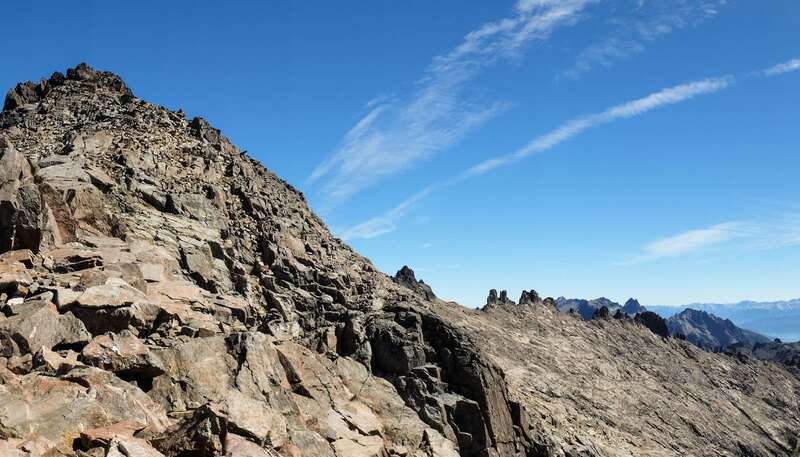 As we would learn, the most difficult technical part of the day comes in the first hour and a half with the scamper up the rock face above Laguna Témpano. After that the only difficulty is finding the trail markers as you make your way to Laguna Negra. There were lots of red dots and blue and white paint as we left the refugio and headed towards Laguna Témpano. 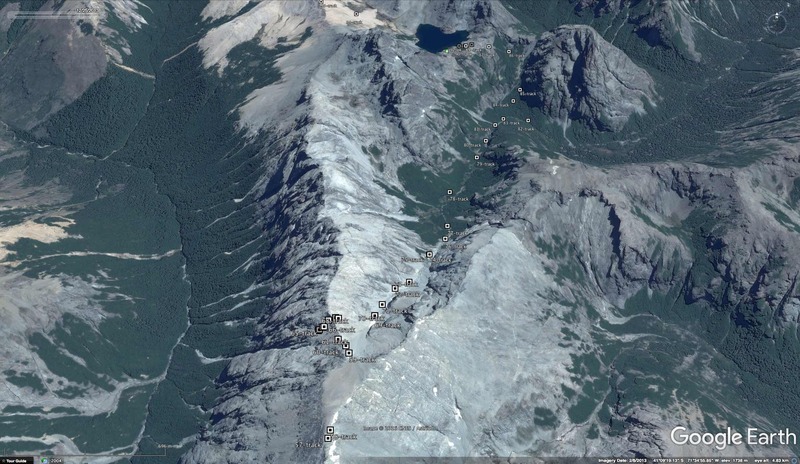 The photos above and below show the gradual uphill of the terrain. Then the markers start to become more scarce and you have to look a bit more carefully as you continue. 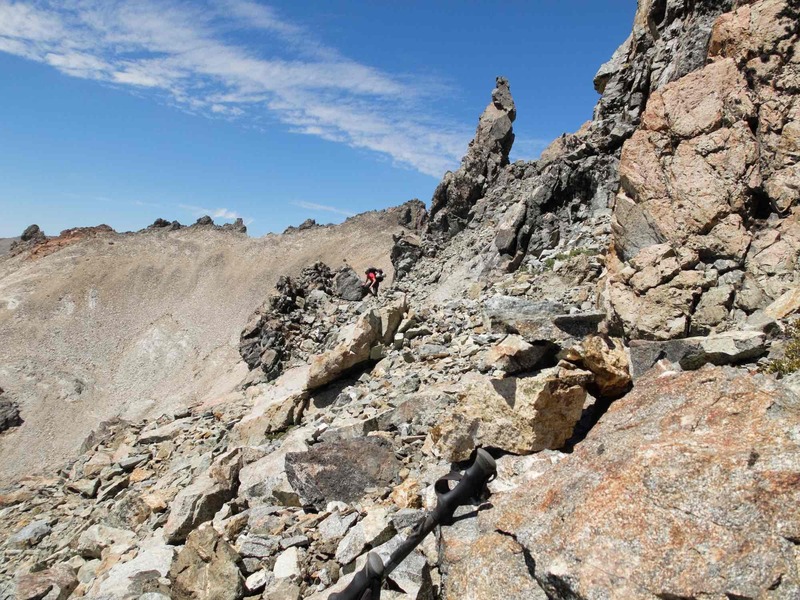 At about 10:30 – as seen in the photo below – we found ourselves on a ridge below Pico Refugio. 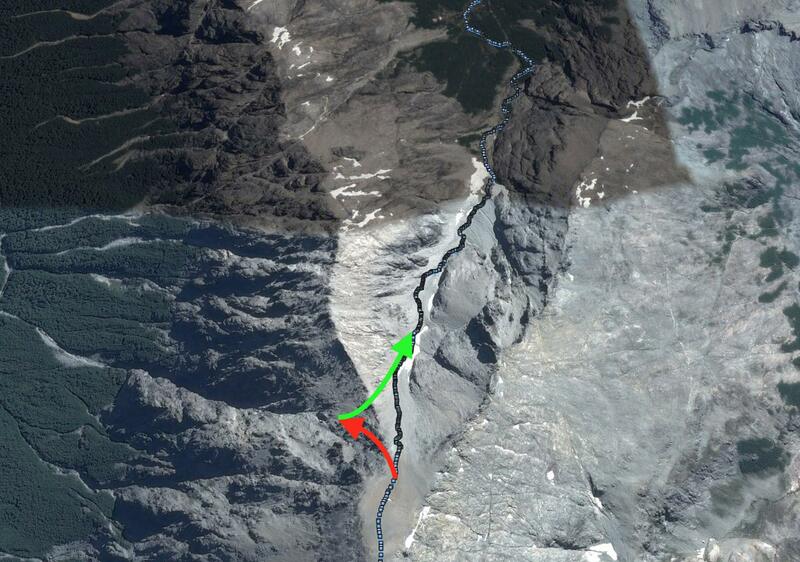 The lowest of the GPS tracks in the satellite image below is where I took the above photo from. We were about to see what all the fuss was about! 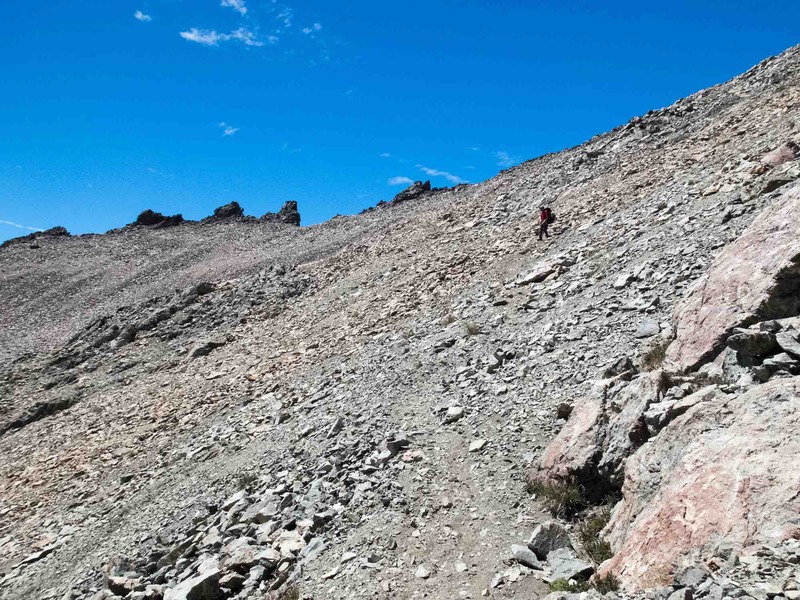 the route above Laguna Los Tempanos – follow the one-every-ten-minutes GPS tracks! 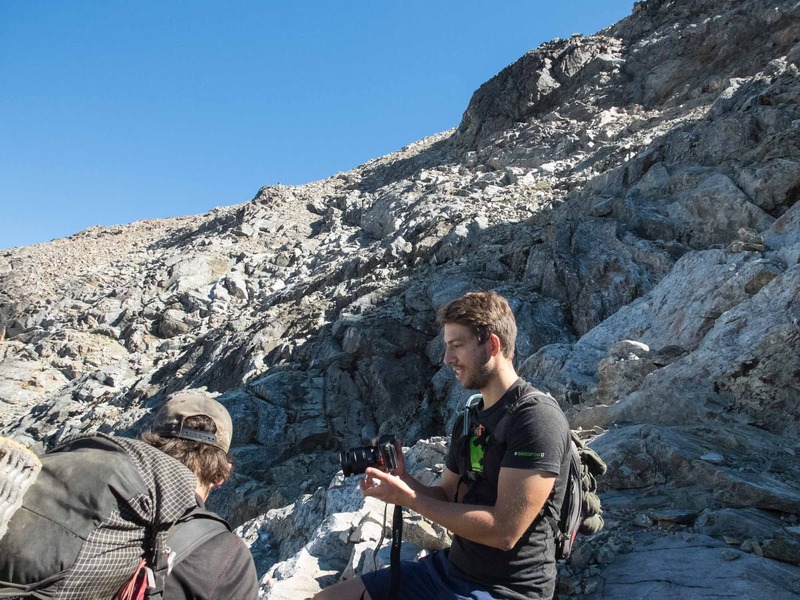 This is where the scrambling up began, Moritz and his GPS track in the lead, Daniel not far behind, and then Diego and finally me, the old guy of the crew and a bit more winded than them! 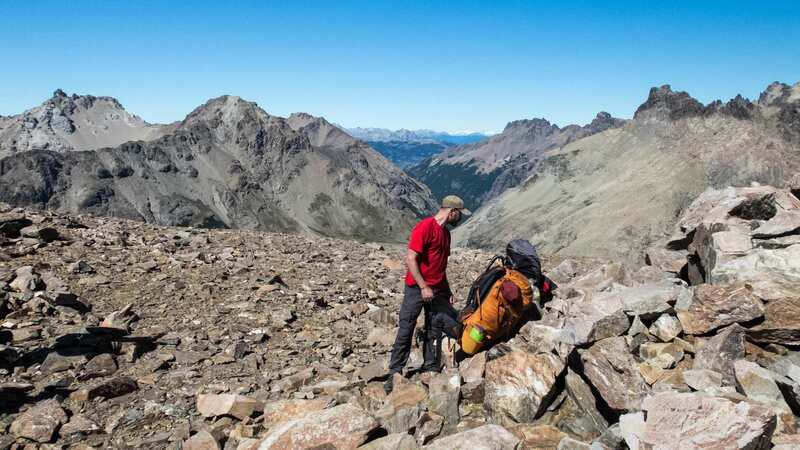 I was feeling fine with the terrain, having done a few summers’ worth of Alpine Club of Canada trips in the Canadian Rockies and some of the minor ranges to the west on very similar rock. I did notice a rock bolt or two drilled into the rock face as we made our way up. Perhaps a guide would make use of those bolts with clients not used to being in this kind of terrain or in case wind or rain or snow made it necessary to secure everyone. I cannot say that any of us ever felt that uncomfortable as we made our way up. The fact that we had perfect conditions did not hurt! We took it slowly and deliberately, stopping every once in a while for photo ops! On on of those little breaks I turned toward the Laguna below and got this panorama that stretched all the way back to Laguna Jakob on the left-hand side of the image. Then I turned around to get a shot of the remaining part of the climb – and Mortiz and Daniel working their cameras! Five minutes later we were on the move again: Moritz leading, Daniel following, Diego in the bottom right of the photo and me looking up and taking the photo. And finally – thirty minutes later we were on top. We had done it! The hut keeper had told us that this exposed section of the trail represented 80% of the day’s difficulties and that the rest would be more straightforward. It had taken us two hours (9:45 to 11:45) to get there from the refugio. Handshakes all around – and maybe some relief that we were spared any drama. Then it was time to say good-bye to Moritz and Daniel. They were going to be switching to warp speed, leaving Diego and me to move along and a more leisurely pace! I did have a GPS track which had the rest of the day’s hike on my iPhone. (I found it at the Club Andino de Bariloche website a few months ago. It no longer seems available. See here for a downloadable copy.) Unfortunately, the Osmand app and maps that I had installed would inexplicably freeze – sometimes it worked and sometimes it didn’t. We did have the red trail markers and occasional cairns to lead us on. They were scarce as we made our way towards Cerro Navidad, a major point on the route and the highest one of the day. The photos above and below were taken around 11:45 after the two German guys had sped onward. After aiming my camera toward the ridge we were heading for, I turned around to get a shot of Diego and our packs. We were on the col below Pico Refugio and took a little break before moving on. Diego and I were both travelling somewhat heavier than the two guys up ahead; Daniel may have had three kilograms in that tiny backpack of his! He was travelling so light he did not even have a sleeping bag with him! I had a tent, sleeping bag,Thermarest pad, Goretex rain gear, food for five days … it all added up to about 15 kilograms. Diego’s pack weighed a bit less since he was sleeping in the refugios each night. A helpful bit of paint on the rocks – the red/white square – told us we were on the “trail”. We would climb up to that low section you see between the two peaks. There is a vertical stick at the top of the cairn in the middle of the shoulder. We would stay high above Laguna Navidad until we got to the ridge which led us to Cerro Navidad and its wooden cross. This part of the trail is very poorly marked and we were sometimes left wondering which way was the right way. 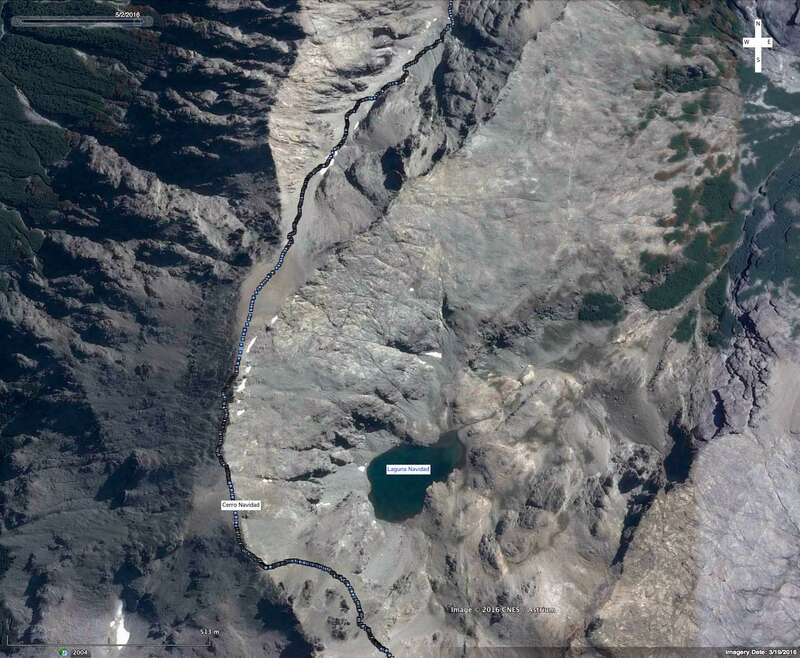 You can see our approximate path on the satellite image below as we crossed the scree slopes high above the laguna. 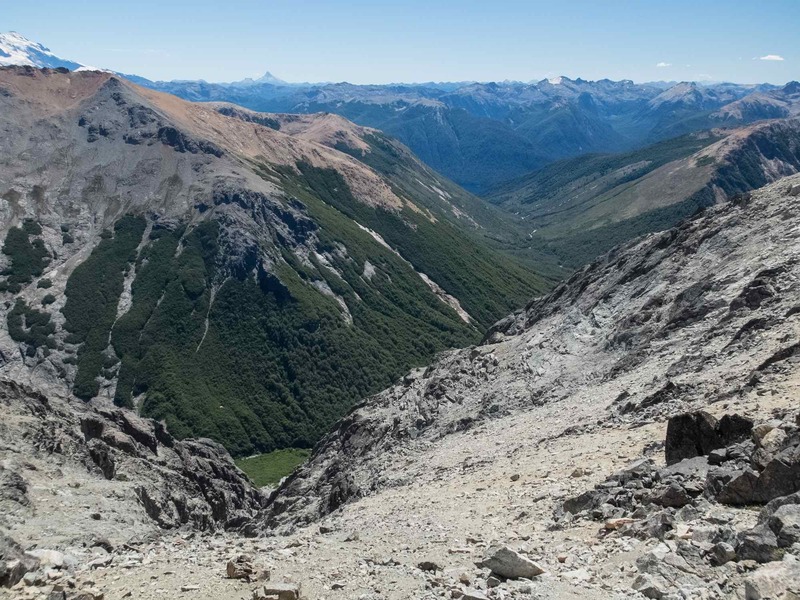 Once we got across go to the west side of the Cerro Navidad ridge we searched for some sign of a trail to continue. We finally found it descending a bit on the other side of the ridge before climbing back up towards Cerro Navidad itself. 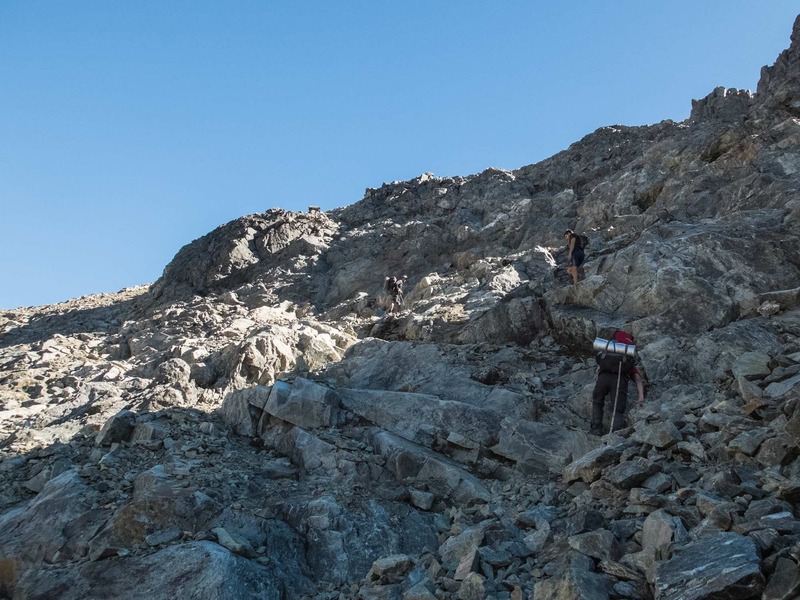 In the photo below we are at Cerro Navidad summit, having spent about four hours (minus a number of rest breaks and lunch) to get there from the Pico Refugio col. 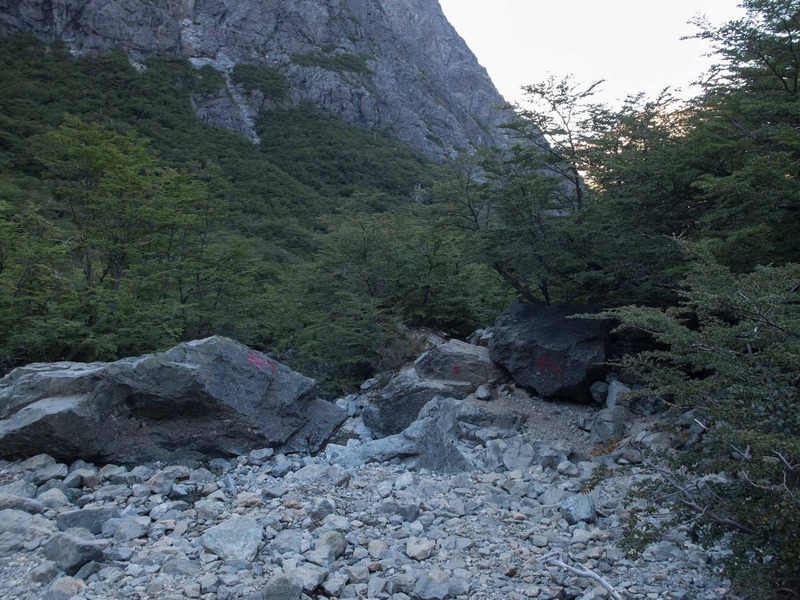 It was a nice twenty-minute walk down from Cerro Navidad across a fairly flat stretch of trail marked with the occasional cairn and splash of red paint. We stood on the ridge with a valley to either side of us. Looking down to the right we saw a snow patch which seemed to have footprints crossing it. I remarked to Diego that the footsteps maybe belonged to our two German speedsters. Any older than a day and the sun would have melted their distinct impressions away. And then – we – or I – made a strange decision. Somehow I figured the trail and the valley we wanted to descend to was to the left! No footprints in the snow – but in the distance on the rock wall at the other side of the gorge, a splash of red. 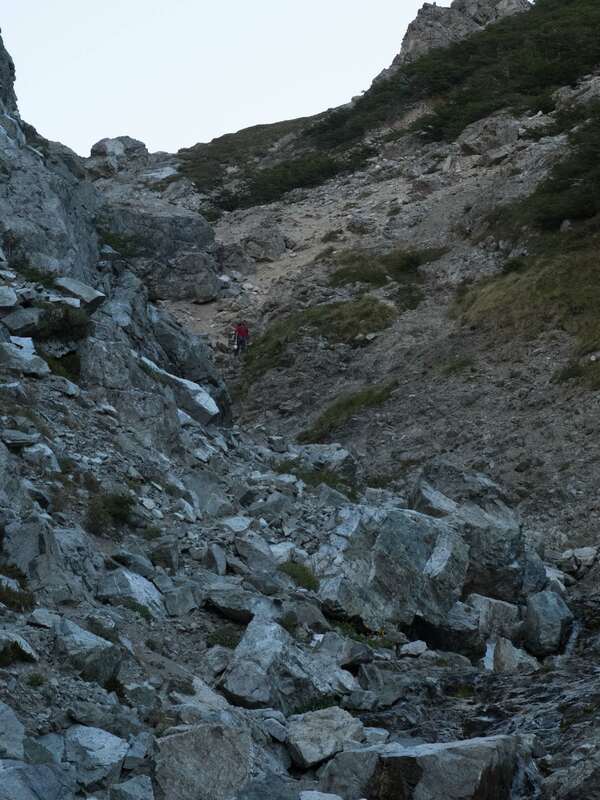 So we headed down the steep scree slope, making very slow progress. It somehow did not feel right but we kept on, me in the lead and Diego behind. Every once in a while I would check my GPS app on my iPhone. It kept freezing up. And then the moment of realization – that red trail marker that I was heading to – well, it turned out to be a bunch of red flowers! We had spent a half hour floundering in the heat on the exposed slope heading to an imaginary red marker! 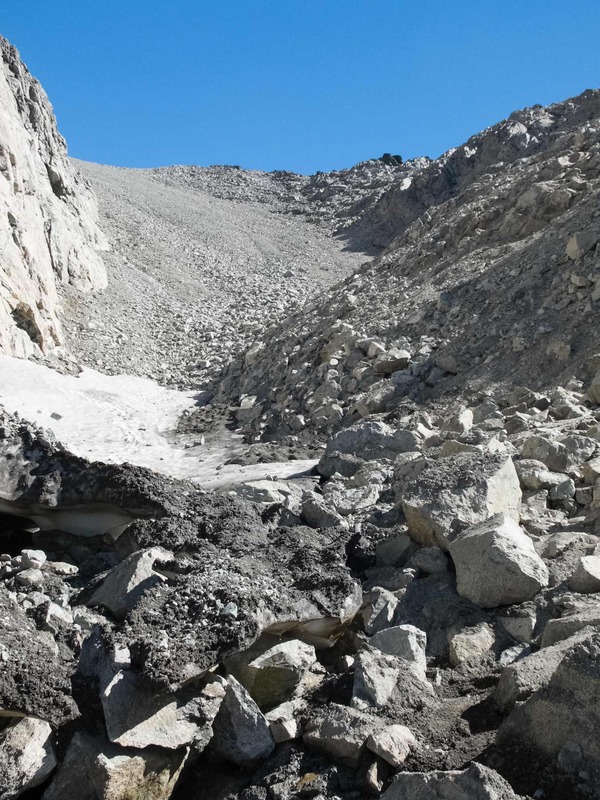 a false descent – the La Chata Valley! Que stupido! So back up we went, not yet seeing any markers but the app was on and it showed that we were getting closer to the GPS track. 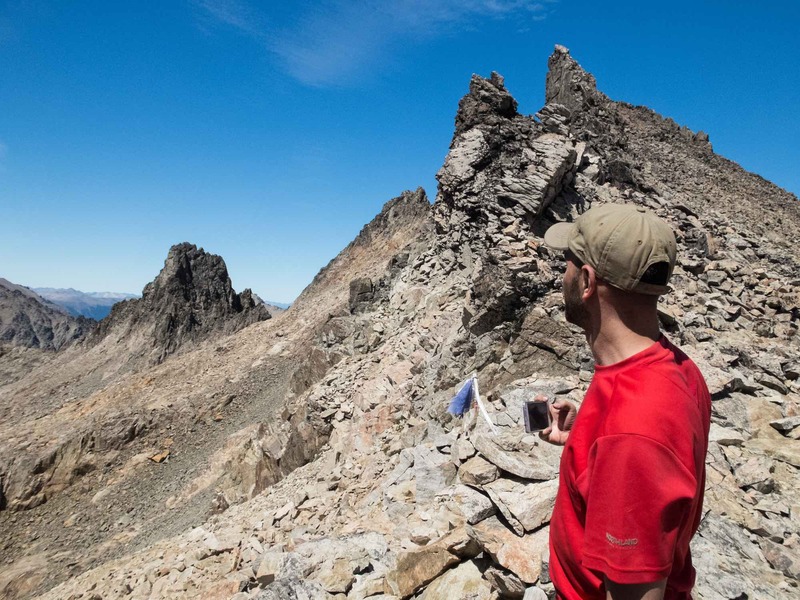 Finally – relief when we reached a point that corresponded exactly to the GPS track location! We had recovered from our one-hour waste of time and energy. And now – to make it even better – we spotted a red dot painted on the rock ahead of us. We were on our way again! As we looked down we saw again the snow patch with what looked like footprints crossing it. Well, a few days later in Bariloche I met Daniel at the only vegetarian restaurant in town and he confirmed that they had indeed walked across that snow. Had we only clued in right away! 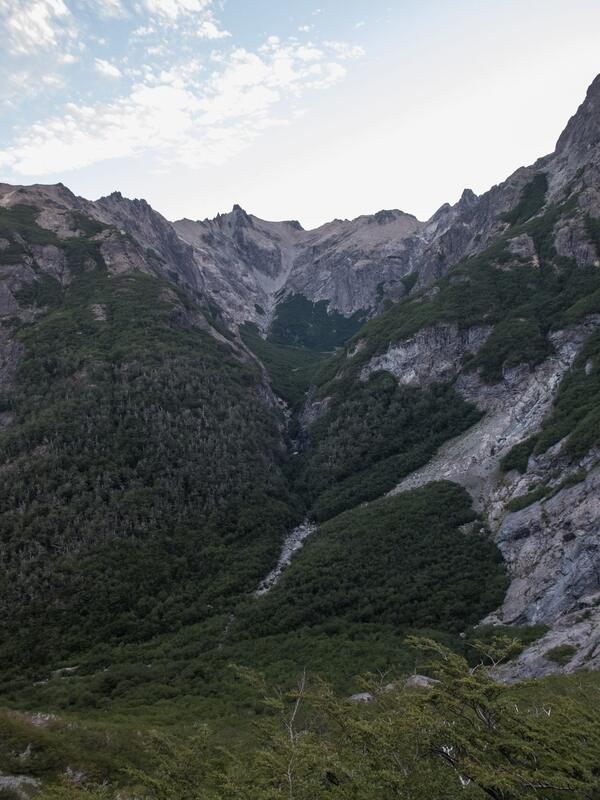 Diego and I filled our bottles with the water slowly trickling downhill from the snow patch and then began the long three-hour scramble down to the Arroyo Negra Valley. It didn’t seem to want to end and it made for difficult walking, even more so for Diego since he did not have trekking poles. He was definitely faster than me going on the ascent; my poles were making a difference on the down part that did not seem to end. 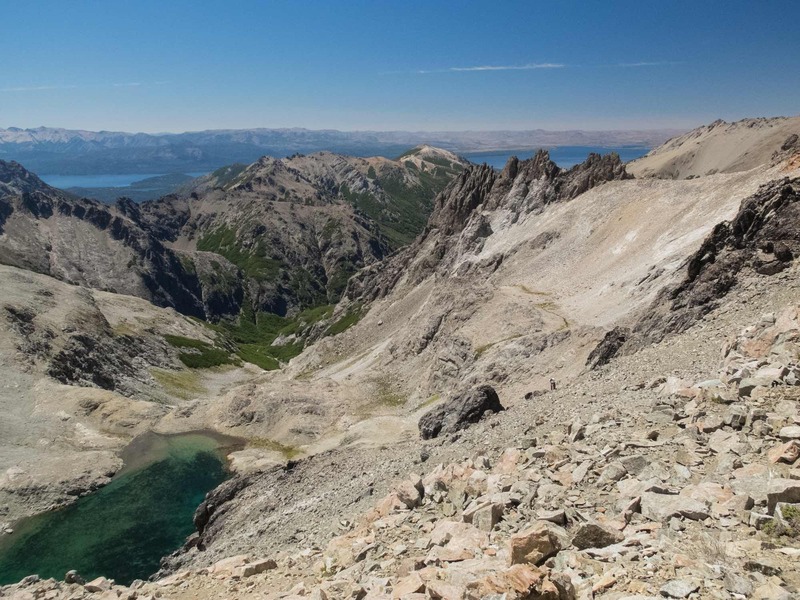 We were headed to the point where the trail up to the Refugio Italia meets the trail coming up from Colonia Suiza. I know that now – but did not at the time! I was maybe ten minutes ahead of Diego at this point and it was about 8:30. Fatigue had definitely set in and I just wanted to get to the Refugio, put up my tent and crawl in! 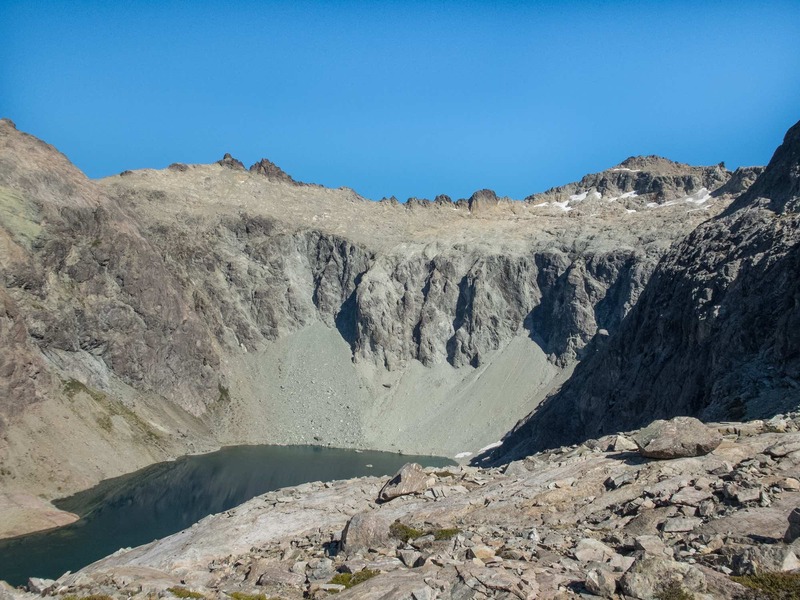 Had I only known what to look for I would not have walked right past the trail which goes up to the refugio. As my GPS tracks show I was instead headed on a wonderful downward sloping trail to Colonia Suiza! Luckily for me some hikers were coming up the trail and when I asked them if Laguna Negra was up ahead, they straightened me out very quickly. They were headed up to the refugio for the night so I turned back with them. I did stop at the junction point while they continued. I assumed that Diego had not yet caught up so I waited there for him. A few minutes later he came down the trail and we both headed up the home stretch to Laguna Negra. 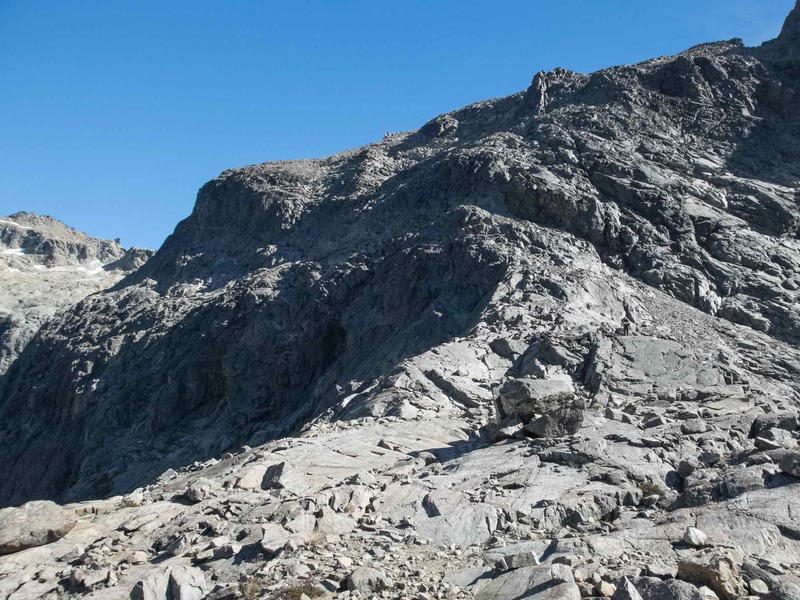 Once we were on the trail up to the Refugio, it was all walk and no photos! The one below is the only one I took over the next forty-five minutes as we made our way up that gorge and onto the ridge to the left. It was 9:20 when we got there! 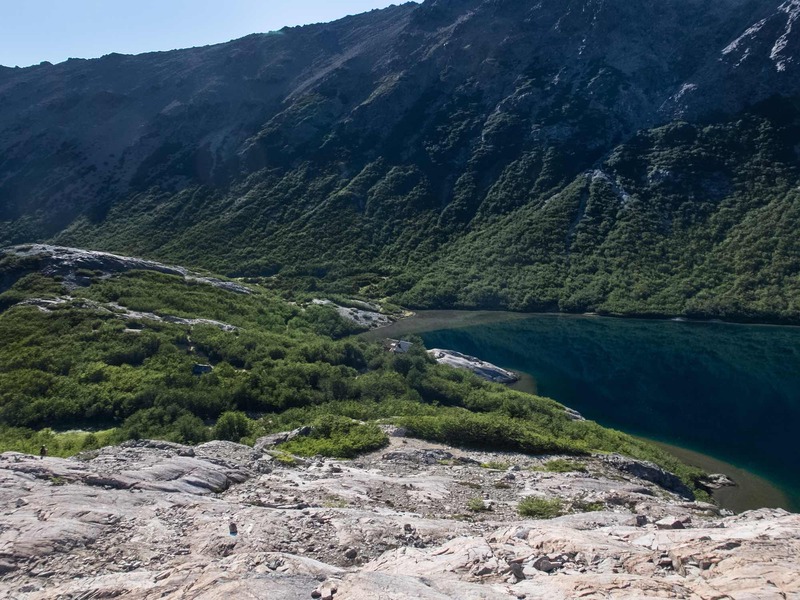 Diego kept walking to the Refugio itself while I looked around for a flat sheltered spot where I could put up my tent. Since hikers are supposed to check in when they arrive, I hoped that Diego would let the hut keeper know that el canadiense had made it! I looked up and noticed the full moon shining over the camping area and then crawled into the tent and into my sleeping bag, relieved to have survived my misadventures. A few sips of water, an energy bar, and an extra-strength Advil and I zipped the tent door shut. I was done for the day! 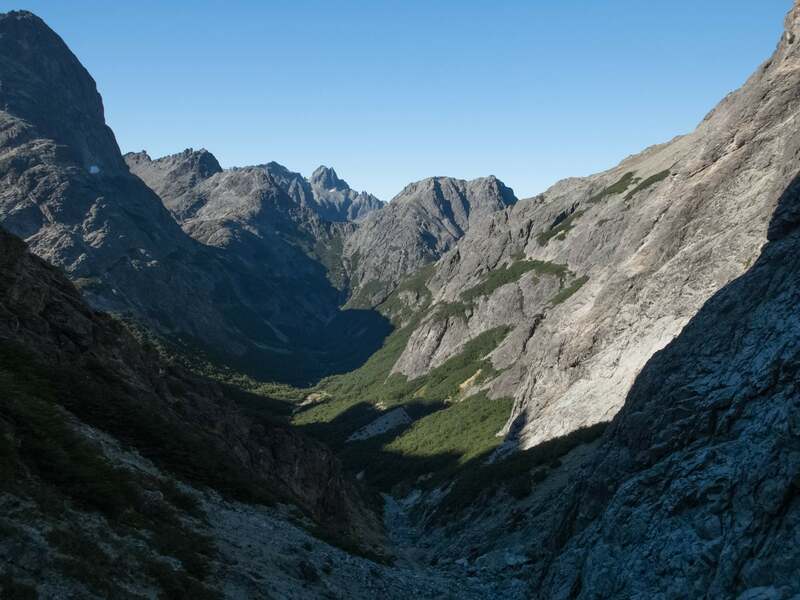 For a 2015 report of the route from Laguna Jakob to Laguna Negra check out this informative account here, complete with lots of great photos. 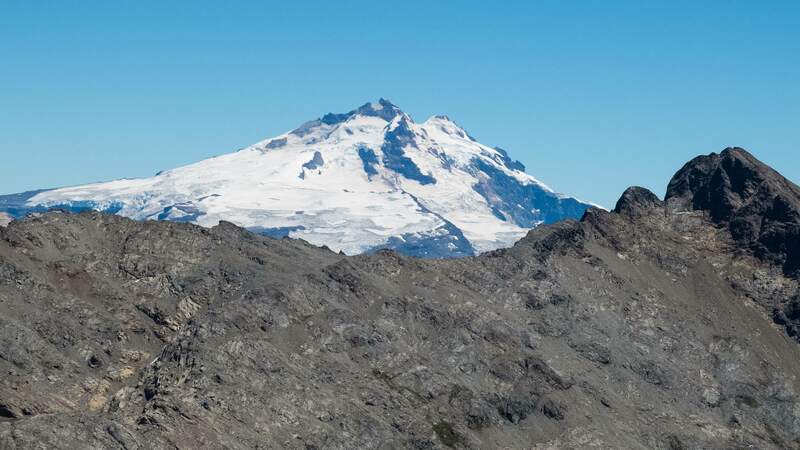 To get an early start the hikers – Richard Hughes and his wife Patsy- set off at 8:00 rather than wait to hear the hut keeper’s trail talk at 8:30. Their crossing was less eventful than mine! 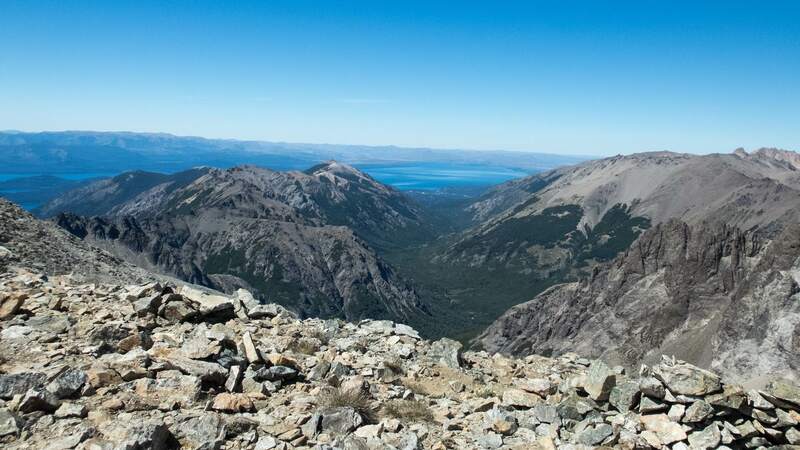 This entry was posted in Argentina, hiking/trekking and tagged cerro navidad climb, Jakob Laguna Negra trail, Laguna Jakob trail options, laguna navidad - nahuel trail, laguna negra trail, Laguna Témpanos climb, refugio Italia, Refugio San Martin trail waiver. Bookmark the permalink.